Another success! Congratulations to 63 year old Joan. In 98 days she has lost 18.4 pounds, 4.1% body fat and 14.5 inches. Only 10 more pounds to go to reach her goal weight of 130 pounds. I train and give her nutrition advice via my online services with one in-person meeting a month. Joan exercises daily and enjoys jogging, swimming, biking, hiking and cycling. She does my weight training program and cardio in the gym twice a week. She averages a 550 daily caloric expenditure. She logs her food on My Fitness Pal every day so we can make improvements to her diet. This week she is on a mission to increase the fiber in her diet. Yesterday for instance she had Flax Plus cereal, nonfat milk, banana, blueberries and pineapple. A Jamba Juice smoothie, fish, bulgur, yellow squash, red potatoes, chicken, carrots and a small piece of dark chocolate. Lots of fiber! And all for under 1200 calories. Although Joan is 63, her “real-age” is probably 25. She moves like she is a healthy 25 year old. I predict her life will be long, healthy and active. (An analysis of 33 studies shows that higher fitness levels are tied to lower risk of dying from all causes of death. 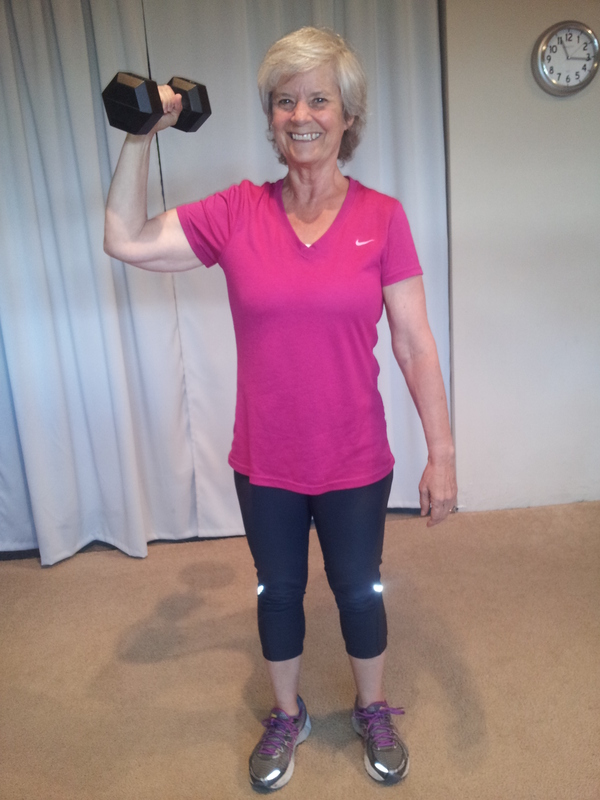 Improved her cardiovascular fitness to what is considered excellent for a woman aged 30-39 years old. This is a client’s actual food log from MyFitnessPal. Want to know how I evaluate it? First read “How to Evaluate the Data from your Online Food Journal”. Then read my notes below to see how she did. Calories. She was right at her goal of 1500 calories. Carbs. Goal for her is 188 g. She had 165 g. A bit short. Were they “healthy, high fiber” carbs? For the most part but 25 grams were from dark chocolate pretzels. Protein. 13 grams short. She did have good quality protein provided by the salmon, chicken and milk however. I would be more concerned about falling short on the protein goal if her protein sources were vegetarian or if she consistently didn’t reach her goal. Fat. She got some healthy fats from the walnuts and salmon. 12 g of unhealthy fat were from chocolate pretzels and blue cheese and had she chosen chicken breast instead of the thighs she could have eliminated some saturated fat. But she gets credit for using balsamic vinegar on her salad. No oil! So she saved some calories and fat there. And blue cheese is actually a good addition to a salad as long as it is in small quantity. A small amount adds a lot of flavor and decadence without that many additional calories. I’m hoping she measured it out though. Her log indicates half a one inch cube. It would be easy to eat so much more and then be underestimating calorie intake. So be sure to measure. Sodium. 2400 mg or less is the goal. Her diary indicates she ate less than 900 mg. I would guess more however because of the teriyaki chicken. I looked on other sites and the sodium content for 1 thigh ran higher up to 1100 mg for this serving site. Sometimes the entries on online journals are incorrect, especially if it was a “member submitted” and not verified. Cholesterol. Goal is less than 300 mg per day. Hers was 163 mg. Good. Sugars. The American Heart Association recommends limiting added sugars to 100 calories daily for women. She had 84 g TOTAL sugars. Her biggest sugar contributors were milk in the latte and fruit. These weren’t added sugars.The chocolate covered pretzels added some unnecessary sugar/carbs. Fiber. Goal is 35 grams per day. She got 21 grams. This is a bit surprising because she did eat whole grains, veggies and fruits. Apparently not enough. She can improve this by adding more fiber-rich veggies to her salad. Maybe broccoli, carrots, celery, a few peas, raw cauliflower. Did she get at least 2 servings of dairy? She had 1.5 servings from the soy milk in the latte and some milk on her cereal. The contribution from calcium is one of the major reasons it is important to eat dairy foods. She did have soy milk which sometimes does not contain calcium unless it is fortified with calcium. Since all soy milk is not fortified, read the nutrition information on labels carefully. Was there a lot of “volume”? Yes. Peaches, edamame, spinach, tangerines, mushrooms and banana. These are filling and lower calorie and more nutritious than other choices might be. If you can picture the food on the plate , it was quite a bit. The salmon was also a good choice. She was able to have a big portion for a mere 240 calories. 6 ounces of beef would be at least double that in calories which means that if she had wanted to eat beef and stay within her calorie goal she could have only had a small 3 ounce portion. Did she eat at least 2 cups of vegetables? Yes. Edamame (can count as a starchy veggies but still a veggie), spinach, mushrooms. Did she eat at least 1.5 cups fruit? Yes.Banana, peach, tangerines. So overall, she did well. There are a few areas to improve on that were brought to her attention because we took the time to assess her daily intake. Now you try it with your own journal entries using “How to Evaluate the Data from your Online Food Journal“.